I went to Nashville last weekend. 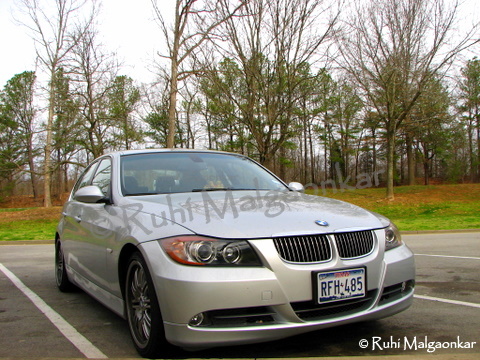 One of my colleagues (Sandeep) got a BMW and he wished to go to Nashville to do its ‘Pooja’ at Sri Ganesh temple there. He asked whether I would like to join them. I was not sure in the beginning but then I remembered one of my friends (Sachin) stays in Nashville. He was actually my teacher when I was studying. He taught me in my college immediately after doing his masters. He was always proud of me and happy with my progress. Years later the relation turned into more of friendship than teacher-student so he is now “teacher-turned-friend”. We didn’t meet for 4-5 years in Pune. Finally got to meet him here. I confirmed with him and he seemed to be pleased by the news that I was visiting him. I told my colleague that I would be able to make it for Nashville. We started on Friday night and it was long journey. We had to cross states of Texas and Arkansas to go to Tennessee State. Total drive one way is around 620 miles, i.e. approx. 10 hrs from Dallas to Nashville. We couldn’t see much outside the car as it was dark in the night. In the morning, we took break at a rest area along the freeway. A rest area is a public facility on the highway or freeway for drivers and passengers to rest, eat, or refuel with minimal facilities like rest rooms, parking space, drinking fountains, telephone, picnic areas (grass lawns with benches), and sometimes more facilities like gas stations, vending machines and restaurants. We got freshen up and had muffins as our breakfast. It was a pleasant morning. American Robin caught my attention and I couldn’t stop myself from clicking snaps of this beautiful singer bird. We started again and reached my friend’s place at 10:30 am. Then we stretched our heads up to see some of the remarkable sky scrappers in downtown. Some of them were AT&T building (also known as the Batman Building), Life & Casualty Tower, BOA Plaza, Hotel Hilton, Hotel Renaissance, and The Pinnacle (under construction). Then we went to riverside of the Cumberland River. We strolled at Riverfront Park and went to ‘Davidson County Public hall and Court house’. There were many beautiful fountains around this building. We crossed Commerce Street and passed by the Tennessee State Capitol building in Nashville. It is the home of the Tennessee legislature, and the location for the governor’s office. This architectural master piece is classic model of Greek lonic temple. There is War Memorial plaza near to it. We had good time in the downtown. From downtown we went to Sri Ganesh Temple at Nashville. This is again a very beautiful place (of course much contradictory from what we saw in downtown). We entered and it was really divine atmosphere inside the temple. As in every temple in US, there were all Hindu deities. There was ‘Satyanarayan pooja’ going on by a priest for some family. I bowed to all gods. My colleague performed pooja of his car. We could hear some classical musical concert which was taking place in hall on first floor. I roamed around the temple and found a cute bird couple called “Cassin’s Finch”. I clicked some snaps of temples from outside as camera was not allowed inside. We returned home and had tea. Savani’s (Sachin sir’s daughter) music teacher had come for dinner with us. Her name is Heather Bond. She is a famous singer and piano player in Nashville. She worked with Vanderbilt University for living and wishes to devote her life to music. It was nice meeting her. After dinner, we spent some time talking about good old college days. Sachin sir asked me where-abouts of my batch mates. He also told about his life, his marriage, his journey till US, etc. By that time, it was already late and we went to sleep. Next morning we bade a good bye to my friend and his family and thanked them for their time and loving hospitality. We left Nashville at 9 am. We drove slowly as we wanted to enjoy the scenic views outside. On the way, we saw dense forests, trees, green grasses, jersey cows, horses, stables, beautiful farm houses, lakes, and all that which I never imagined to see here. We could relish real countryside of the US. Spring season is gradually painting the trees with different colors – green, yellow, white, pink, purple, red. We crossed The Mississippi River while entering the Arkansas state. There are many rivers like Buffalo National River crossing this state and it is a land of mountains and valleys, thick forests and fertile plains. This is why Arkansas is called ‘The Natural State’. We had planned to wait at one of the state parks in our journey. 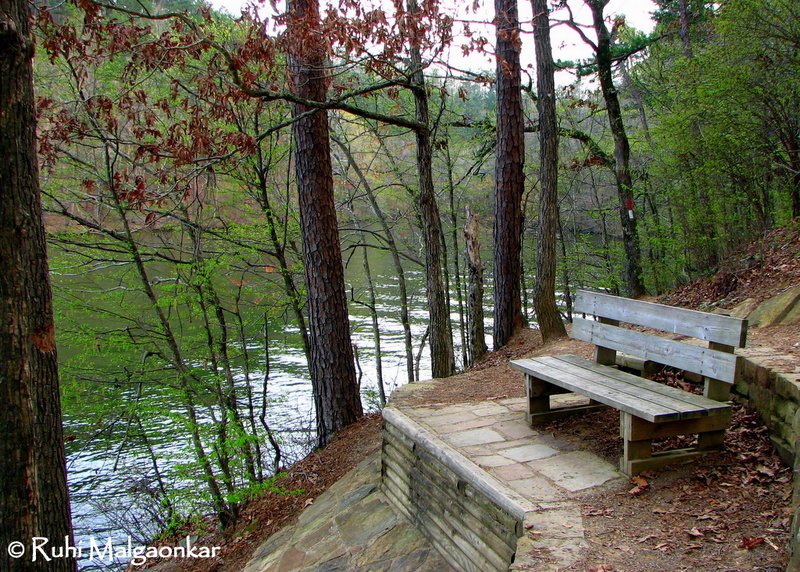 State parks are different from our normal parks. These are protected parks for an area of land preserved on account of its natural beauty, historic interest, recreation, or other reason, and under the administration of the government of a U.S. state. People come here to do all kinds of adventurous activities like hiking, camping, sailing, water sports, nature trail, birding, photography. I found few American Black vultures and Turkey vultures on the way.